S S Rajamouli's latest film Magadheera starring Ram Charan Teja (Chiranjeevi's son) and Kajal Agarwal had perhaps one of the biggest openings in Telugu. The reincarnation saga -- a part-period, part modern film -- was lapped up by the audience. 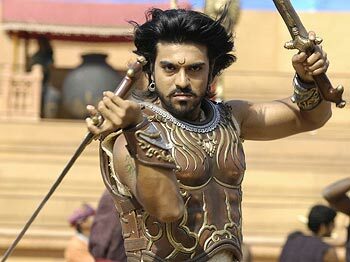 Are you happy with the way Magadheera has been received? Were you apprehensive about its performance? I am obviously happy [laughs]. What else can one ask for? My cousin in San Jose said that tickets were priced more than a Hollywood movie. The film has got a tremendous reception. I was not apprehensive though the people's expectations made me tense. Normally I am a cool person and don't get tense before a release but this time the expectations were too much. When you were entrusted the task of directing Charan by Chiranjeevi garu, did you first think of the reincarnation theme or were there other ideas? Reincarnation is not often used in Telugu cinema. Is that why you chose it? Actually, I first thought of mythology/folklore at least partly. Charan's image and body language would suit that kind of get-up. The theme of reincarnation has been with my father for quite some time. So when we narrated the story, Chiranjeevi garu okayed it. To reach out to the commercial aspects, we had song, dances and fights. We had the best of both worlds. Did Chiranjeevi agree to the story? What were his inputs, if any? He has vast experience and knows everything. He said the story was okay. He gave a few suggestions, more to do with finer nuances and asked we could use if we liked them. We did incorporate a few of them. Doing such a film, almost a magnum opus, involves great hard work and research even though it's a fantasy tale. How did you do it? Working hard is a pleasure. I enjoyed every second of it. We did research for the film. Technically Magadheera is brilliant. Is this why the film has been in the making for two years? How did you achieve the technical brilliance? The delay happened because of the time it took for the detailing in the film. Second, the stuntmen's strike also delayed the shoot. The main person Kamal, the VFX producer, was linked to 500-600 individuals and companies. It was a huge job. There were many who contributed to this technical brilliance. You made Charan do a lot of hard work in terms of learning horse racing, sword fighting, bike stunts... Did he do all the serious stunt/fight scenes himself? Charan is also a horse rider. He had to just brush up horse riding for the film. He did everything himself, every single shot. There was no duplicate used. How was it directing him? He's quite a cool guy and is not like a megastar's son. He is normal and down-to-earth. On what basis did you choose the film's heroine, Kajal Aggarwal? I saw her first in Lakshmi Kalyanam and liked her work. She was supposed to do Yamadonga but it didn't work out. I wanted somebody good looking, who would look like a princess and who had dates available. Kajal met those prerequisites. How did you land up doing a love story which I think you are not comfortable doing? Will you do more love stories now that you have done one? I forced myself to do. I can't avoid or escape. I will do more definitely. You were tight-lipped about the film before its release? Was this a deliberate decision? I never discuss the film before the release. After the trailer was released, there was tremendous impact. We also had no time to do anything beyond that. Would you like to say something about Senthil (DOP), Ravinder (art director) and the editor? Senthil and Ravi are my two pillars. The kind of detailing they did was enormous. The editor (Rajamouli calls him Chanti) is also my guru. If he would not have edited the film, we couldn't have released it on time. He was not just the editor, he took charge of everything singlehandedly -- all the post-production work. I must mention Peter Haynes (stunts coordinator) who is a bundle of energy. No one knows he's the stunt coordinator till he comes on the set. He will be meddling around with everything. He knows everything from welding, tinkering to mechanics. He uses all his knowledge to get his shot right. He's the best stunt coordinator we have. He met with an accident on the sets, had two broken ribs, fractured hands and jaw and lost all his teeth. Within a month, he was back on the sets with his face and body covered in bandages and plaster. He could barely lift his hands to shoot. That was the kind of dedicated technicians I had. Yes, Kajal looked good. She [Rama] didn't dump her with jewellery and clothes. When the clothes were brought to me, I would ask, is that all and she would say, yes. She's stubborn. In the Bhairavakona episode, a serious scene, she made Kajal wear a dress of baby pink and pista green. When I told her this had to be changed, she didn't budge. She said that Kajal would stand separate and not get mixed up with the others. Though I did not agree at that point initially, later when I saw the edit, I agreed on that. Keeravani is the main support of the film. He's like a doctor who dissects the story -- the good and the bad points, what should be changed, what should not be there. He should have been a mathematician. For Magadheera he made the tunes slow, melodic and classy. There were reports that the music is not good but he had the foresight to see it would go down well with the film. What was Chiranjeevi's comment after seeing the film? I showed him the pre-final edit. He liked it immensely. He was thrilled and congratulated the team wholeheartedly. He had a few suggestions. One main one was that the film was a bit lengthy after the 100-men fight sequence and he felt it should be trimmed. We adhered to that suggestion and trimmed the film accordingly. Were you worried at any point that you were doing a high-budget extravaganza? Just towards the end of the film, I was. We were always given the green signal and told not to think about economics. It was only after the release of the trailer and the hype that I got tense. I was working with Allu Aravind garu for the first time but I had worked with Prasad garu before in Chhatrapati. Prasad garu is also a close friend. The only thing I would like to say is, please don't give me the freedom, for I can't bear it. What is your next film Maryada Ramana about? I'm thinking of releasing it by the end of the year. I am trying a new genre -- a thriller with no comical acts but which will nevertheless induce laughter.